Revolutionary all-Canadian radio telescope maps Universe, hunts for FRBs, Dark Energy. THE FOLLOWING IS A JOINT PRESS RELEASE FROM McGILL UNIVERSITY AND THE UNIVERSITY OF TORONTO. CHIME, the revolutionary Canadian radio telescope inaugurated today in British Columbia, incorporates creative technology that will enable it to simultaneously tackle major astrophysics and cosmology topics — including studying the nature of “dark energy” by making unprecedented maps of the distant Universe, and determining the origin of the mysterious phenomenon known as Fast Radio Bursts. Unlike traditional telescopes, CHIME (short for the Canadian Hydrogen Intensity Mapping Experiment) has no moving parts. The telescope, produced by 50 scientists from the University of British Columbia, the University of Toronto, McGill University, and the National Research Council of Canada “sees” the radio sky in a novel way: It uses over a thousand antennas to record the information from all the radio waves falling across its surface. The radio signals are converted to digital data at a rate of 13 terabits per second – comparable to the entire world’s mobile data rate. This amount of information can’t be stored, so it is processed in real time. With these techniques, CHIME is able to digitally “point” anywhere within a wide stripe of sky overhead, making traditional telescope steering unnecessary. More importantly, it is able to look in many different directions simultaneously. 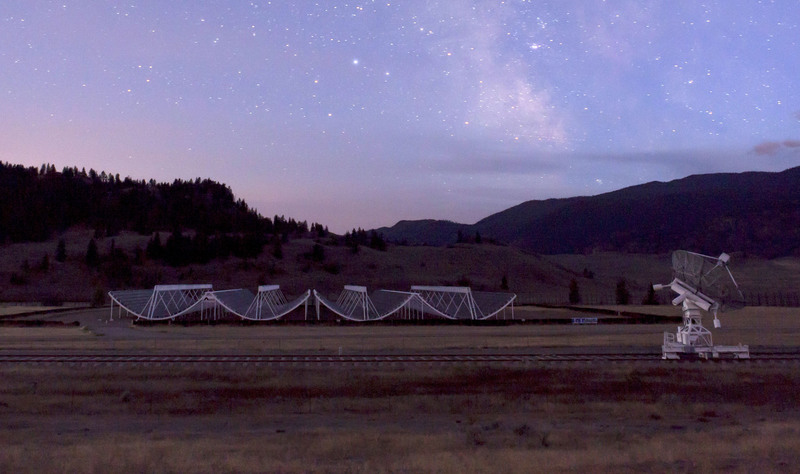 The innovation that has led to CHIME was made possible by creative new technology developed at universities across Canada, allowing this telescope to be built with $16 million (Canadian) in federal and provincial funding — a fraction of the cost of other world-class radio telescopes. At the heart of CHIME is a sophisticated digital network and signal-processing “brain,” known as the correlator, where the massive amount of information from radio waves is processed into an image of the overhead sky. The correlator developed by the team is unparalleled in the world in terms of raw networking and processing rate, and low cost. To achieve this, the team had to develop new, custom innovations integrated with market-driven commercial technologies. The custom-designed-and-built circuit boards convert radio signals detected by the antennas into digital data. They split these data into about a thousand different radio frequencies, much like a glass prism separates different colours of light. The data are then passed through a giant custom-built data network. U of T graduate student Nolan Denman working on a CHIME correlator node. Together, 256 nodes combine to form the correlator which processes CHIME’s data. The second crucial component of the CHIME correlator was built by assembling a huge array of Graphics Processor Units (GPUs) — technology driven by the computer gaming industry — into a specialized supercomputer built for this application. 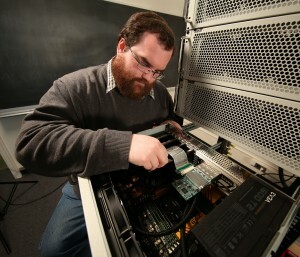 By cleverly reprogramming the GPUs, researchers at the University of Toronto were able to use this supercomputer to construct cosmic sky maps while simultaneously enabling a sensitive search for Fast Radio Bursts. A sensitive instrument to detect Fast Radio Bursts is also being developed for CHIME. Consisting of 128 compute nodes, this instrument can search continually for fast radio transients in the entire area of sky viewable by CHIME. Sophisticated algorithms and software pipelines have been developed to sift through 130 billion bits of data per second in real time. “By making smarter computer algorithms we have prepared CHIME to be the world’s most efficient Fast Radio Burst search engine,” says researcher Kendrick Smith of the Perimeter Institute, one of several other institutions contributing to the project. CHIME, now in its commissioning phase in preparation for science operations, was built at the Dominion Radio Astrophysical Observatory (DRAO) near Penticton, B.C., with funding from the Canada Foundation for Innovation, the governments of British Columbia, Quebec and Ontario, and the Canadian Institute for Advanced Research.